Archbishop Thomas Wenski preached this homily Aug. 13, 2018, at Our Lady of Częstochowa Shrine in Doylestown, Pennsylvania, during the evening Fatima Mass and rosary procession. Simeon predicted that Jesus would be a sign of contradiction — the cause of the rise and fall of many; and that a sword of sorrows would pierce his mother’s heart. Today, the 13th of August, reminds us of the truth of these words that speak to us across the centuries in the Word of God, words that should comfort us in our trials as we struggle to witness to hope in a world that, because it wishes to live without God, without reference to his truth, finds itself increasingly without hope. 101 years ago, today, the shepherd children of Fatima were to go to Cova de Iris, as they had in other months, where they were to meet the Lady whom we know now was the Queen of Peace, the Blessed Virgin. Thousands had gone before them hoping to catch sight of the vision; but the children did not arrive. They were kidnapped by the town’s major, taken to a police station, where they were threatened with various punishments unless they recanted and declared that what they had reported was a fraud. 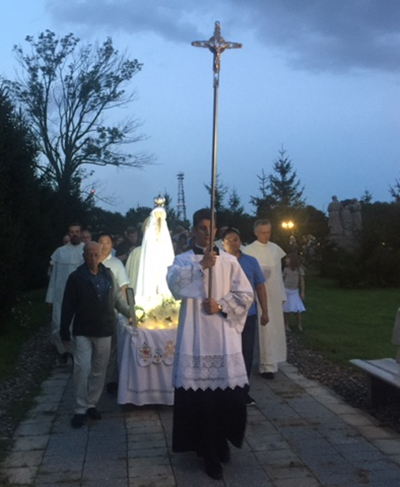 Participants carry an image of Our Lady of Fatima during a nighttime procession Aug. 13 at the Shrine of Our Lady of Czestochowa in Doylestown, Pennsylvania. Though they very young — simple children of simple people — they refused to deny the truth of what they saw. The mayor and his cohorts thought that they could put fear into the hearts of these shepherd children — but they failed. In fact, when the day was over the children were released — and it was the mayor and his people who were afraid. In today’s reading from the Book of Revelation, the beloved apostle to whom Jesus entrusted Mary, his mother, writes of the struggle between the woman and the dragon. The dragon, in St. John’s vision, certainly represented the power of the anti-Christian Roman emperors, from Nero to Domitian. Next to the power of the Roman Empire, the early Church must have appeared as a defenseless woman with no chance of survival and even less of victory. But the passage refers more than just to the struggle between the early Church and Nero; rather it refers to the epic battle between good and evil that the People of God are engaged in while we traverse this “valley of tears.” And how often, throughout history, the power of evil and hatred seemed so much stronger than the power of good and love. This was certainly the case during much of the 20th century: World War I, the Great Recession, World War II, the Cold War — and serial holocausts: Armenians, Jews, Cambodians and, of course, the unborn killed through abortions. But Fatima reminds us — God has the last Word. In the epic battle between good and evil, God will win — and we will share in that victory if we heed Fatima’s message of peace, a peace found in and through repentance and reparation. As Pope Benedict said in a catechesis on the text of our first reading, the dragon, “exists in new and different ways. It exists in the form of materialistic ideologies that tell us it is absurd to think of God; it is absurd to observe God’s commandments…Today, too, it seems impossible to imagine a God who created man and made himself a Child and who was to be the true ruler of the world.” But even though this dragon in its new incarnations once again seems to be invincible, it is still true today that God is stronger than the dragon: It is love which conquers rather than selfishness. And so, as the woman who confronts the dragon is Mary, the woman in John’s Book of Revelation is also the Church, “the presence, the guarantee of God’s love against all the ideologies of hatred and selfishness.” That the gates of hell will not prevail against the Church is shown in Mary’s own exaltation as Queen of Heaven and earth. In Mary’s child, the dragon is vanquished. At Fatima, Mary entrusted to the shepherd children — and through them to us — a great weapon to use against the dragon of the Apocalypse. It is a simple yet powerful weapon for the spiritual warfare that is part of our daily life in this “valley of tears.” That weapon is the Holy Rosary. It is not a weapon of violence or intimidation but rather one of peace and healing: for praying the rosary leads us to a more intimate relationship with the Mother of Mercy, our Life, our Sweetness, and our Hope. In a world still threatened by weapons of mass destruction, we have in the rosary — as Mary indicated to the shepherd children of Fatima — a weapon of mass conversion. Indeed, at Fatima, Mary urged prayers for peace — and for the conversion of Russia. If we examine history through the lens of faith, it would be hard not to see the connection between the fall of the Berlin Wall and the dissolution of the Soviet empire which had so threatened world peace throughout much of the 20th century and those countless rosaries offered for peace especially by those who lived behind the Iron Curtain.